Now a very popular marine theme and everything that is somehow connected with the sea. For example, one of the most simple images – it is an anchor. 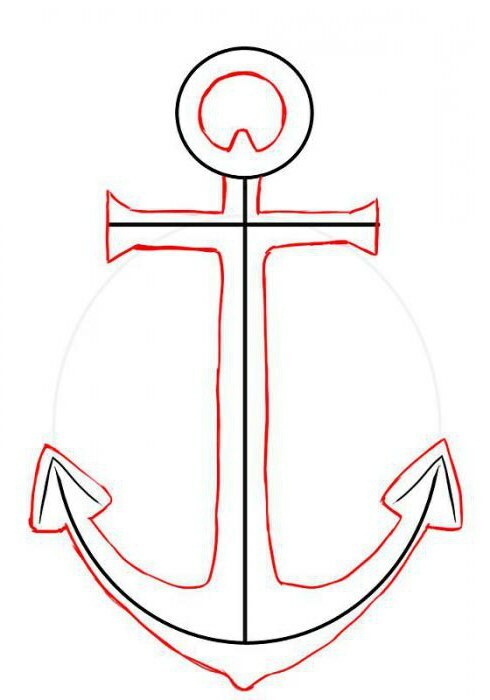 To draw an anchor is easy, and his way, we may face daily on the Internet and in real life. Where is found the image of an anchor? Anchor – it is a symbol of hope and a favourite image of all sailors. It is found on some coins, and also often used by tattoo artists, after all, anchors are among the most common tattoo designs. To draw an anchor is not difficult, the finished image can be supplemented with many interesting details that will make it special. Drawings of anchors perfectly complement almost any decor, and fit into the design of holiday cards, for example, on February 23. Let's try to portray him. How to draw an anchor with a pencil in stages? Step 1. Let's start with the “frame”, namely – with two lines forming a cross. Here we will outline the dimensions of our pattern. The height of the anchor should be about 2 times the width. Step 2. At the upper end of the vertical lines outline the small circle. This is a future loop of rope or chain (ring). Step 3. Now for the bottom of our anchor. Here you need to draw a smooth arc with a width slightly greater than the horizontal lines of the cross. At the ends of the arc-arrows, looking up. Step 4. Schematic image ready. Now you need to draw the anchor along the contour. To start inside the circle will make another – smaller diameter, so our loop will appear thickness. Step 5. 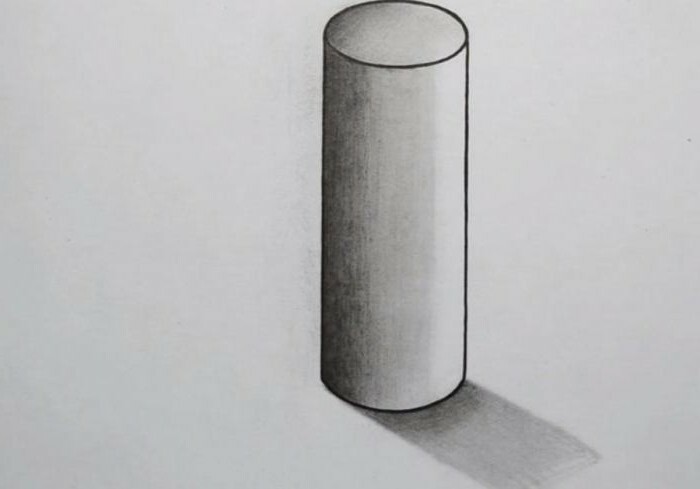 Draw the rod (the horizontal bar of the cross). They also need to give a little thickness. At the ends of the crossbar must be thickening with a rounded or pointed shape. Step 6. Dorisovyvaet the vertical part. It is, as a rule, slightly thickened downward. Step 7. Now the worst part – the arc of the armature. It is important to make them more symmetrical. Start painting from the tips. They better pull themselves up and round off the outside. Step 8. Are flowing lines from the tips to the lowest point. There will also be the pointy end. Step 9. It only remains to connect the arc with the main vertical part of the anchor. Here we have drawn the anchor! This is one of the simplest his of pictures. You can now modify it, to diversify and decorate. How can I expand the image? 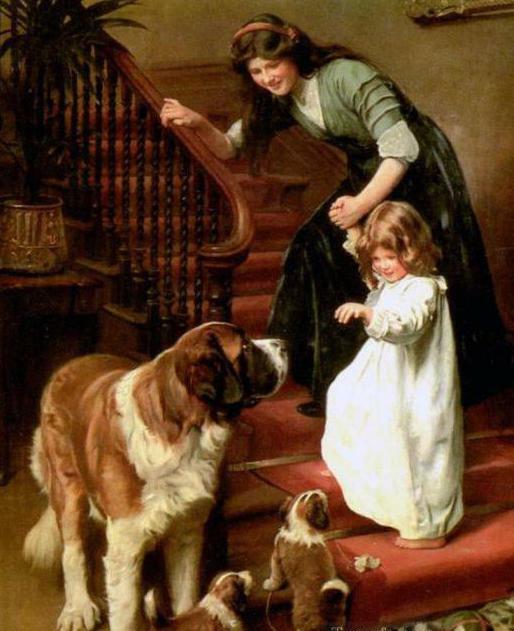 There are many original and unusual variations already presented in our earlier picture. 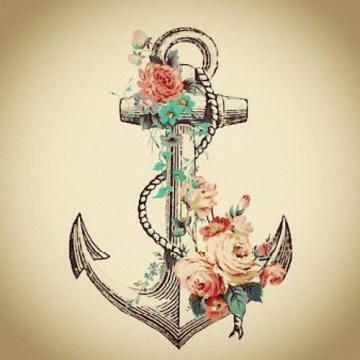 You can draw an anchor entwined with rope, tape and chain to add to the picture other items on nautical theme, for example, lifeline or the wheel, to Supplement the illustration with birds, roses or other flowers to create an unusual background. All at your discretion!